1. Water bottle – Flying always tends to have a dehydrate me. I make sure to fill my bottle on the way to the airport, and I down as much as I can in the gate before takeoff. Although some airlines are now unwilling to refill water bottles, I’ve had better luck traveling abroad, and I’ve hydrated better as a result. 2. Smartphone – Despite the potential for a high phone bill when traveling abroad, the smartphone is a vital part of my workouts when I’m away from home. It allows me to take pictures, find a route, look up places to refuel, and call Taylor for help if I run out of sour candy. 3. Stretching gear – I try my best to bring a stretching strap, lacrosse ball, and The Stick with me wherever I go. San Francisco Airport has a yoga room in Terminal 2, and although not all airports can match that level of pretension, I like to incorporate stretching into my workouts whenever I can. I’ve recently added cables to my repertoire and will be trying them out for resistance on this trip. 4. Running shoes – If I had to choose one of these items, it’d easily be running shoes. Running’s my go-to workout away from home – it’s fast, efficient (oh so important in Denmark) and most importantly, it allows you to see a new destination on foot. 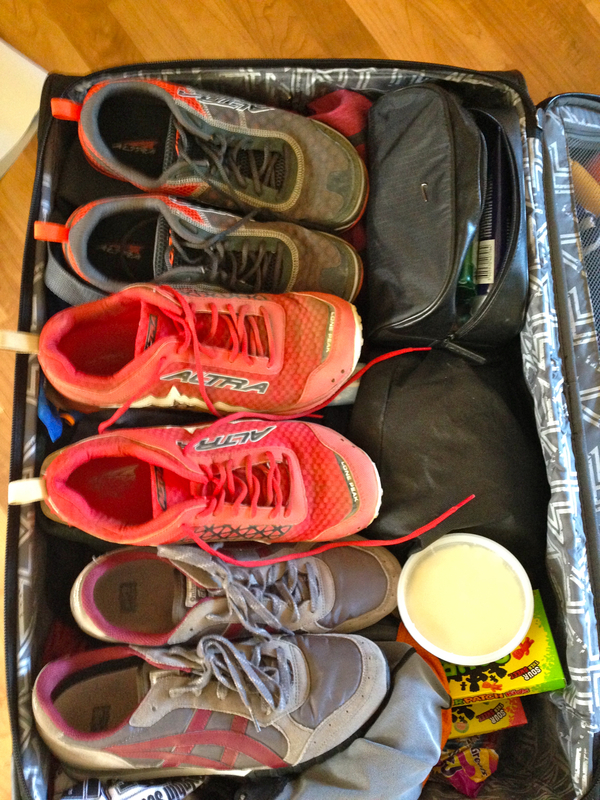 When the opportunity presents itself, I pack both road and trail shoes. 5. Nutrition – At a minimum, I like to bring enough to fuel me before and after workouts. Taking fuel out of the equation saves a lot of time on the road – I can wake up, down some fuel, workout and know that I won’t have hunger pangs afterwards. Honorable mention: compression socks – I don’t have any hard science to quantify it, but compression socks make me feel good. I wear them during and after long runs, along with long plane rides.